Great Fiat Talento van Leasing & Contract Hire Deals. Our Fiat Talento Lease Deals. There's no doubt that this Talento has what it takes to offer an attractive alternative to the Transit Custom, Vivaro, Transporter and Trafic models of this world, but whether you'd want one over its Citroen and Peugeot design stablemates will depend as usual much upon the deal that you're offered and the proximity and convenience of your local franchise. Which is where Fiat reckons it has an advantage. An increasing part of the company's dealer network is open 24 hours a day for service and repair work to minimise business downtime and even those that aren't, usually feature flexible and extended opening hours. If you're running a business on tight margins, that's the kind of support you're going to need. Added to the excellence of this Talento, it could just make for a very attractive business proposition indeed. Fiat's LCV sales have been growing steadily over the last decade thanks to a vast investment in new product which now sees its Professional van line-up offer businesses everything from a 2.5m3 Fiorino van to a 17m3 Ducato. The Transit Custom-sized Talento model we're looking at here lies somewhere in the middle of this little lot and claims to offer all the benefits of a very large van with the affordable running costs of quite a small one. This LCV is better placed than its Scudo predecessor to compete with a whole army of mid-sized rivals. Not only the Transit Custom but also tough competitors like Volkswagen's Transporter, Vauxhall's Vivaro, Renault's Trafic and Mercedes' Vito. Taking on this lot isn't something you'd want to do single-handed, so the Italian brand has chosen to share this design with both Citroen and Peugeot, whose Dispatch and Expert models are pretty much identical but have different engines. With this Fiat, you get clever design, proven powerplants and low running costs in a package that certainly works on paper. Whether it'll cut the mustard day-in-day-out though is what we're here to find out. Vans have been becoming more and more car-like in recent years - and this one is no exception. The driving position, though not as high-set as you'd find in the marque's larger Ducato model, is nonetheless commanding. And it's comfortable on the move, coping admirably with the atrocious surfaces offered up by poorer sections of the British road network. That relaxed approach also extends to the electric power steering, which at speed, could offer a bit more feel. You appreciate its lightness around town though, where this van is impressively manoeuvrable for its size. If you're used to very big vans, you will have to adjust to this one's lower stance. This, combined with the big front overhang, can initially make parking a bit tricky, though rearward vision is helped hugely by the huge door mirrors with their separate wide-angle reflectors. Under the bonnet, the Talento gets a range of efficient 1.6-litre turbo and twin-turbo diesel engines, all equipped with a six-speed manual gearbox as standard. There's a choice of two engine design themes - single-turbo MultiJet units or more efficient but pricier twin-turbo Ecojet powerplants. The MultiJet models come with 95 or 120bhp. The Ecojet options come in 95, 125 and 145bhp forms. From a design standpoint, the Talento is compact and well-proportioned. 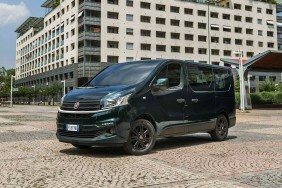 The forward- stretching windscreen connects neatly to the short bonnet and the overall effect creates something a lot better looking than the old Scudo model. The grille is designed to wrap around the headlights and the squared-off rear end allows for ample inner space and a high load capacity, while giving the Talento a broader stance. Inside, the Talento features comfortable ergonomically shaped seats and a useful 90-litres of in-cabin storage space that's delivered in a variety of shapes and sizes (including compartments hidden under the seat base and behind the seat back of the passenger seats). We like the additional blind spot-mitigating ViewPlus interior mirror, the innovative fold-down central seat with detachable clipboard holder and the available smartphone/tablet holder. An advantage this Talento offers over Fiat's smaller Doblo Cargo model is the standard fitment of a properly sized middle third seat. To free up space for this and make it easier for the driver to slide over to the passenger side of the cab, the gearstick has been mounted on a protruding moulding in the centre of the dash. It still rather gets in the way if you're trying to slide across the cab and limits the middle person's legroom. Still, the third seat is useful to have - and quite adequate for mates on short journeys or kids you might have to drop off on the way to work. Fiat Professional's pricing for this Talento model is, as you might expect, not too different from that of the old Scudo range. Excluding VAT, the figures start at just under £20,000 for the entry-level 1.6-litre MultiJet 95hp SWB standard roof van. There's a premium of around £400 to upgrade to the pokier 125bhp Ecojet engine, while around another £1,000 gets you the faster 145bhp Ecojet unit. If you want the long wheelbase bodystyle, the engine options start with the 120bhp Multijet unit, priced from around £21,500. Crew van and Combi versions based on the LWB chassis are also available, plus a platform cab option if you want it. Standard equipment across the range includes remote central locking, electric front windows, electrically operated and heated door mirrors, a full bulkhead, a height adjustable driver's seat with lumbar support and an arm rest, a dual passenger seat and a full-size spare wheel. There's also a powerful audio system with Bluetooth and DAB, plus USB and Aux-in ports and steering-wheel remote controls. The SX version adds air conditioning, a 'Mobile Office' package that helps you to work on the move, a 'ViewPlus' rear view camera, rear parking sensors, upgraded ""Living Brown"" interior trim and enhanced exterior detailing. SX versions of the Talento van and crew van are priced at £1,000 more than the standard model.